Sweet violets are in full swing here on the farm! So far, I have made sweet violet tea, attempted to make sweet violet syrup, and have made two types of violet blossom vinegar. 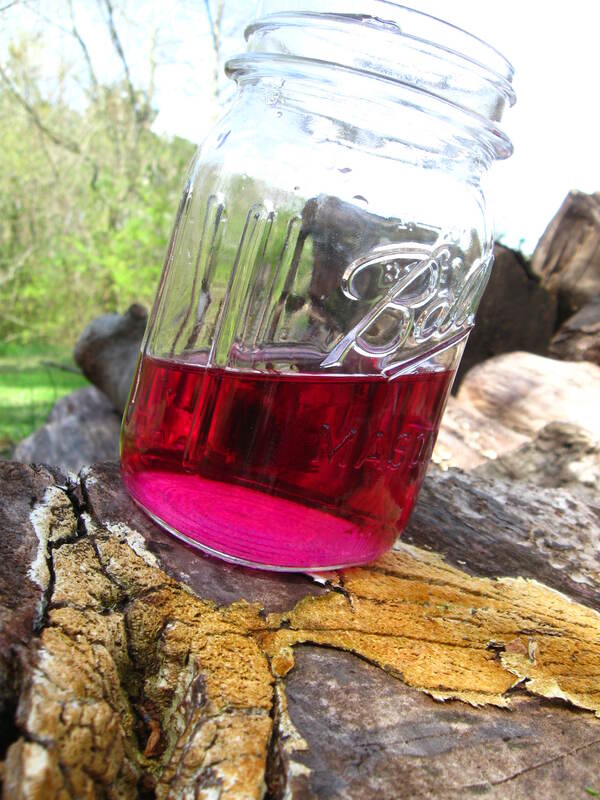 The success with the projects has varied somewhat; the sweet violet tea was surprisingly beautiful (an incredible blue), and the vinegars are flavorful and a visually stunning magenta but the syrup accidentally crystallized so I will have to revisit that project later. I think that the violet infusion would be a lovely menu item for a brunch or tea party (everyone should have tea parties, don’t laugh! ), and the white vinegar infusion would be very nice for salad dressings or maybe even pickled eggs. Pink like beets, but floral instead of earthy? Yes, please. 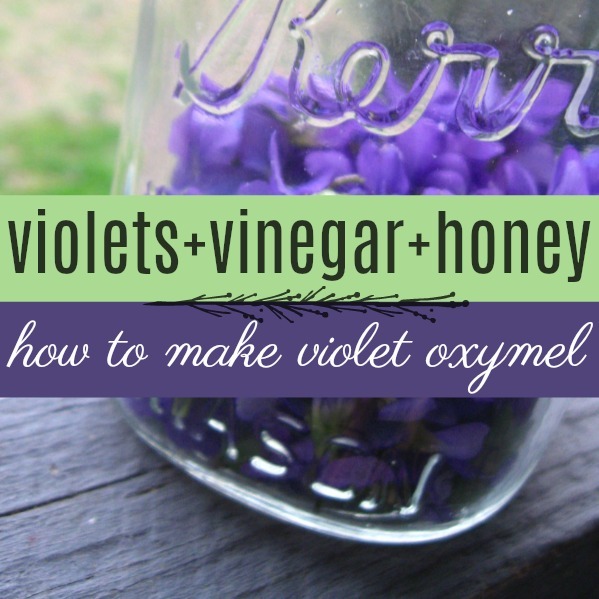 But I think the real gem of my violet experiments thus far is Violet Oxymel. 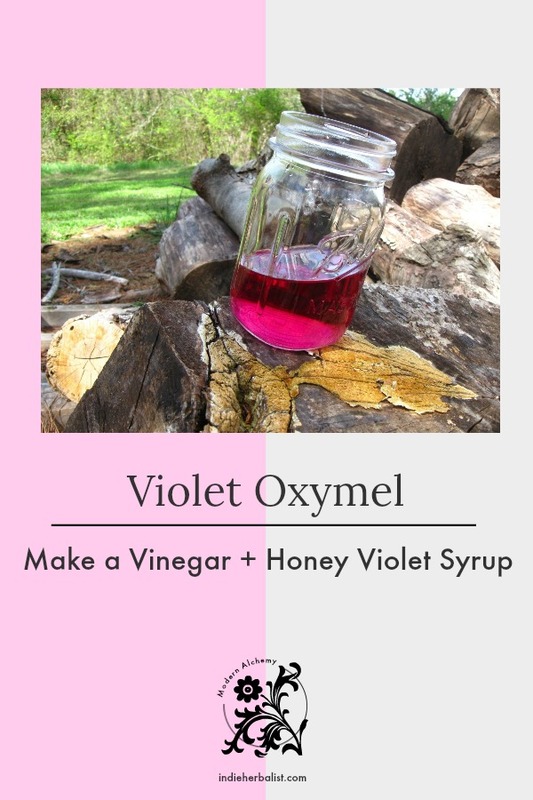 Oxymel is a complicated word for a simple concept: vinegar + honey = oxymel. As a general rule, oxymels are soothing for coughs and sore throats, and a lovely digestive tonic before or after a meal. They can either be enjoyed by the spoonful without dilution (deliciously sweet and sour), or stirred into a glass of warm or cold water. 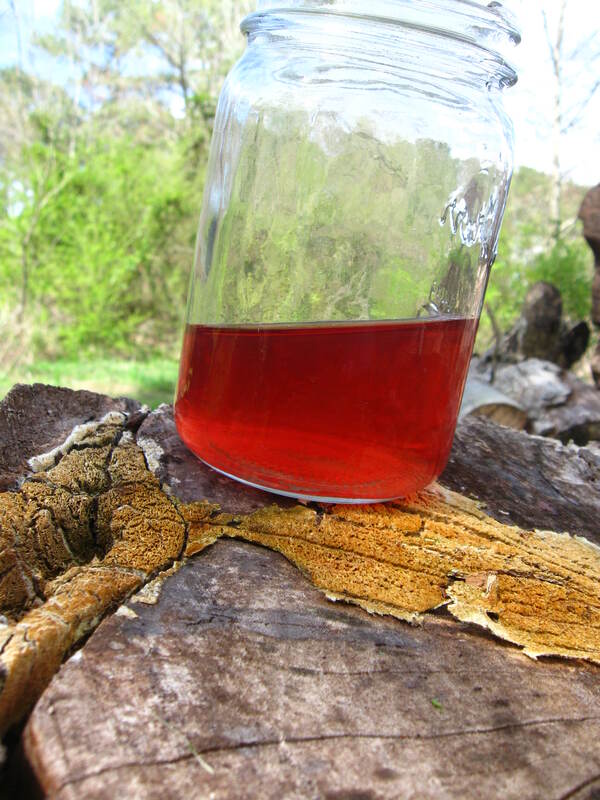 To make violet oxymel, you will first need to make an infused vinegar. To do this, use a 1:1 ratio of violets and vinegar. In this case, I used a cup of each. After allowing the blossoms to steep in the vinegar for a week, strain the vinegar through a fine mesh sieve to remove the flowers. The apple cider vinegar won’t display as much of a shocking color change, but it definitely takes on a reddish hue. The ratio of honey to infused vinegar is up to you, but a quarter cup of honey for every cup of vinegar is a good place to start. More honey can always be added if you would prefer that it be sweeter. Stir the honey into the vinegar. It will usually take a minute or two for the ingredients to mix, so don’t worry if the honey seems to clump together at the bottom. Once the honey has dissolved completely into the vinegar, the oxymel is ready to use! As a beverage, violet oxymel is especially refreshing over ice, but it makes a nice flavored water at room temperature, too. Place a layer of parchment paper under the lid if you are using a canning jar with a metal ring and lid. Vinegar is used in canning without a problem, but I find that my herbal vinegars sometimes react with the lids. Glass containers with non-reactive lids are definitely better if you have them. Pick violets around noon on a dry, sunny day. The fragrance of the flowers will be at its strongest under these conditions. Don’t feel bad about picking all the blossoms you need. The purple flowers are just for show- they almost never set seeds! 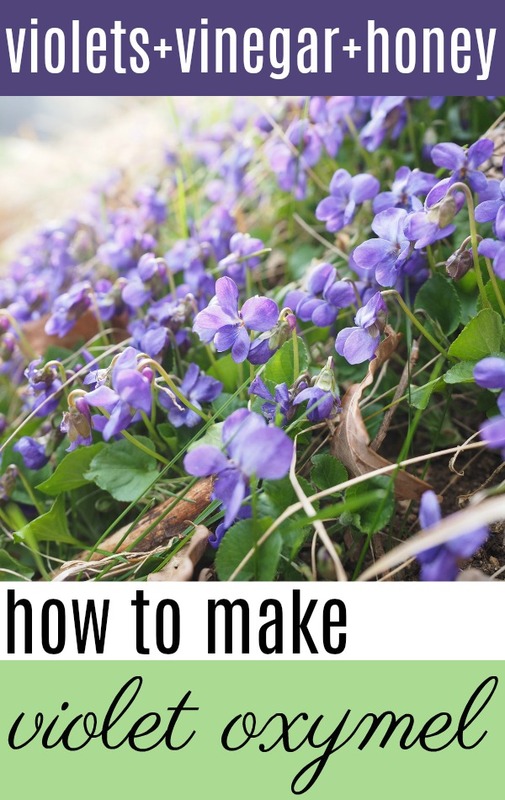 Violets grow a second set of tiny, green flowers in the fall that set seed prolifically. Use just the blossoms- you don’t need the stems. Sweet Violet, Viola odorata, is native to Europe but is very common through out much of the united states. It often grows in lawns and along woodland edges, although it can be hard to spot at first because of its small size. Violet merits consideration for household use, especially because it is found so widely in backyards and vacant lots. There are several culinary uses for violet. First, the above ground parts are edible. The young leaves are great as a salad green or lightly steamed much like spinach. Violet flowers are lovely candied, enjoyed as a fragrant tea, or added to salads. 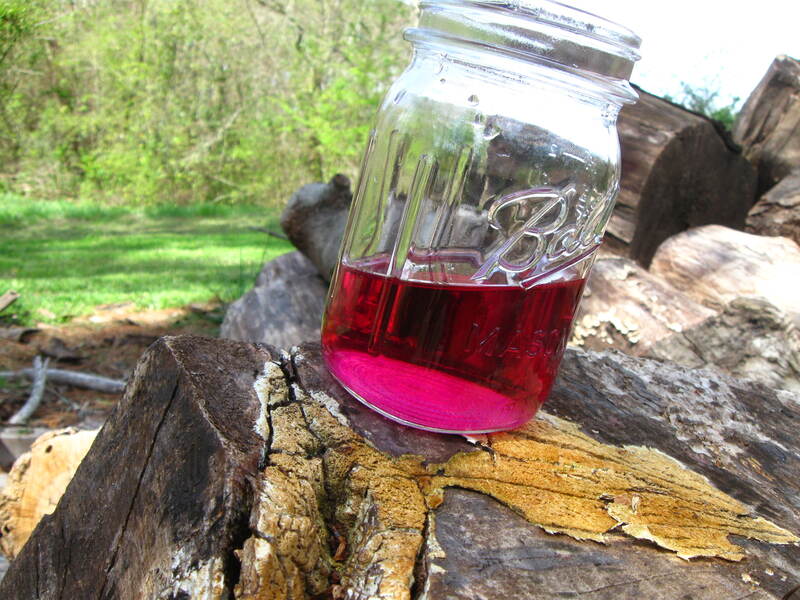 Violet syrup, also made from the blossoms, is a unique flavoring for desserts and beverages. Beyond culinary uses, violet has a historical reputation for being expectorant, ant-inflammatory, diuretic, and alterative. Use the underground portions of violet with caution, if at all. Historically, they have a reputation as a strong purgative and emetic. The leaves and flowers, however, are gentle and mild enough for children. As a children’s herb, violet is useful for encouraging regular bowel movements or soothing fevers. 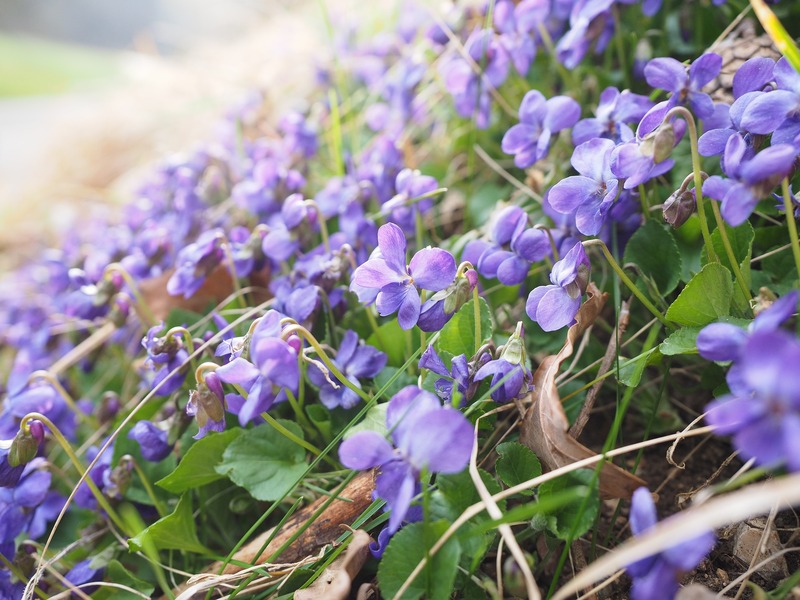 Even though people can be dismissive of violets and consider them almost as much as a nuisance as dandelions, I’m always thrilled when I find them volunteering in my garden beds or creeping into another area of the lawn. With so many wonderful uses, what’s not to like? 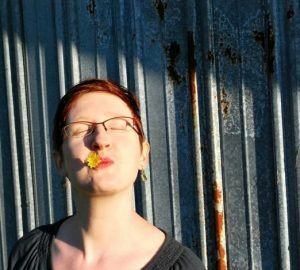 Did you know I wrote a book full of creative, easy herbal recipes? 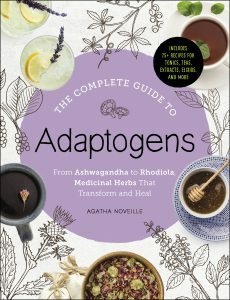 My book, The Complete Guide to Adaptogens, features herbs like schisandra, tulsi, and eleuthero to support vibrant health and wellbeing!